I am not sure about the pizza boxes, I have three cats and have never had one sit on a pizza box. Sitting on laptops or computer towers yes. The wall staring, well that is a "things that make ya go hmmmmm". Two out of three of my cats will continuously love on me while I am on the throne, or they will sit on the counter beside me and demand I pet them, or they will jump in my lap and demand I hold them. LOL Not sure why, but this is what mind do. I read that cats keep you company at the toilet because that's when you're most vulnerable and they want to know if their human is still wanting to harm them at that moment. It has recently been discovered that cats see ultraviolet light. Just because we can't see it (blank walls), doesn't mean it isn't there. P.S. my orange cat doesn't just keep me company while I'm on the toilet, he scratches the floor like he's trying to bury my business. It doesn't keep me up at night, but it does make me self-conscious. You do your business on the floor?! 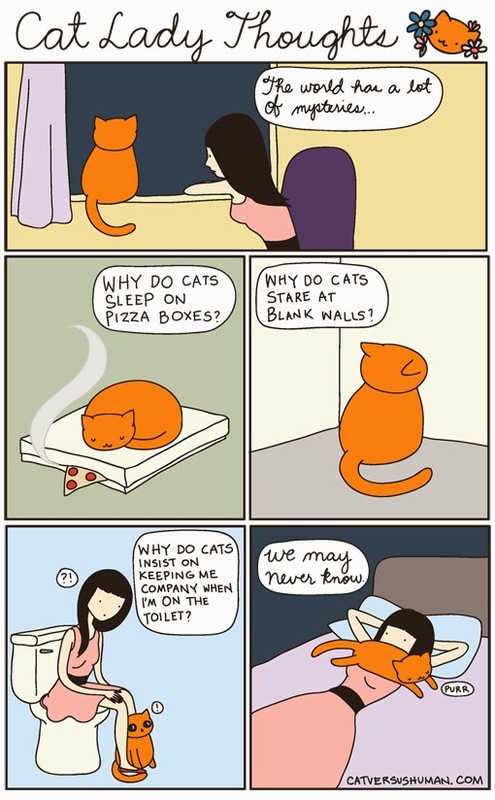 Is your cat looking at moving shadows/light on the walls or are they truly staring? If so, how long? You may want to research further. Apparently head pressing (usually placing the head against the wall but can be staring for long periods or other related symptoms) can be a sign of neurological problems in your dog or cat. If you see them doing this please consult a vet. They'll stand about a foot away from said wall & stare at a fixed point like it is the most fascinating thing in the world. Yep, I have three cats and all three of my cats at some point during the day will sit and simply stare at one point of a wall. Their does not move as if they are looking around, their eyes do not move as if they are looking around. They simply stare at one point. I have seen them do this for a few minutes then take off and run through the house like they had lost their mind. I have no idea why they do the things they do...all I know is it is entertaining. thumbs up for this comment! Please make a shirt of the pizza cat! I also have cat in my home some time her activities are so different and I am not able to understand that. Your blog is too good on cats. Hi, i love all your work. I don't know if this is something usually for you too, but to me is always be saying that tonight my cats won't sleep with me because i don't sleep very well. Anyway, i can't resist when they cuddle on my legs to sleep. Would be great if you could consider this to a new post (no need to be mentioned, of course), would be an honor. Well, it's up to you. Once again, i love your work! So I guess the comic is dead? It almost never updates anymore. I can delete the bookmark? Mirar fijo la pared muy seguido, es digno de un problema de salud.y ademas para llamar la atención!! !